Taking attendance is completely optional but recommended. Navigate to the "Calendar" from the main menu on the left. Click on the lesson or event you would like to take attendance for and click the “Attendance“ option from the pop-up. When the attendance pop-up appears, choose the appropriate attendance option. If you would like to include lesson notes that can be emailed to the student and/or parent(s) select “Add Notes“. NOTE: Do NOT mark "Student paid at lesson", as Amped School of Music handles billing. Your attendance can also be taken from your Home Agenda. How can I assign repertoire to a student? 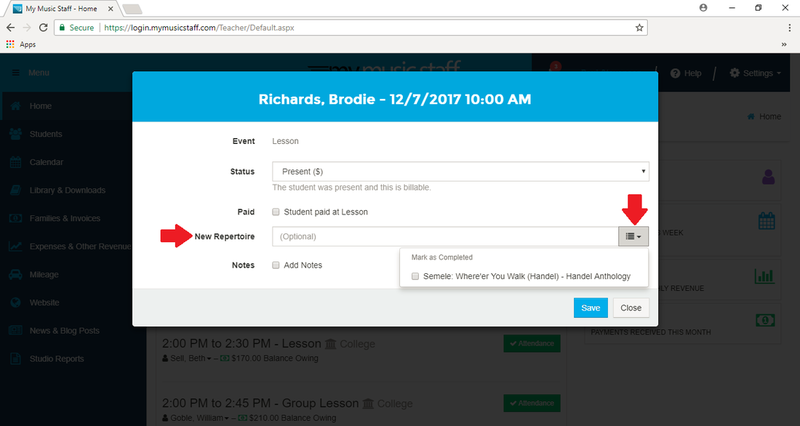 You can assign a student repertoire through their Student Details page or while you're taking attendance. Navigate to "Students" from the main menu on the left. Click the blue "Zoom" icon to the left of student's name. Click the "+ Add Repertoire" button. If a student's status is set to "Present", you will be presented with the option to add "New Repertoire" or mark the student's "In Progress" repertoire as completed.